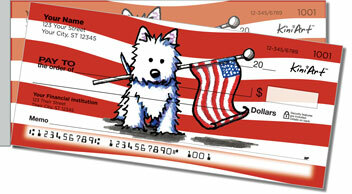 Not only is it a grand old flag, it's a gay old time with these patriot checks from Artist Kim Niles of KiniArt, combing a love of dogs with a love of the best country on earth. If you love chanting, "USA!" 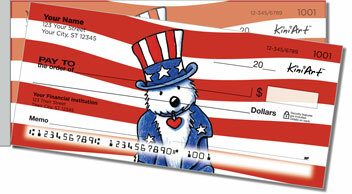 and you're proud of everything our forefathers have done for us, then you'll love these checks. American as apple pie and baseball all rolled into one, these red, white, and blue beauties comes with 30 deposit slips and one free check register totally free. 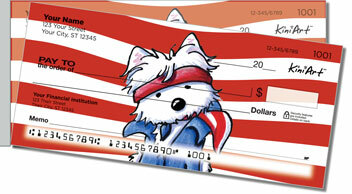 Now you can even get free shipping when you order any designs from our Licensed Artist program. 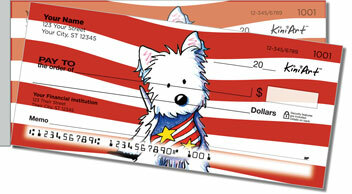 Celebrate your love of terriers and America with these glorious personal checks today!